Yu-Gi-Oh! 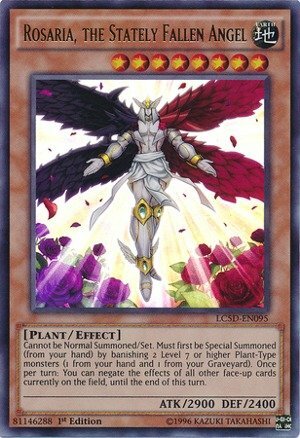 is a strategic trading card game in which two players Duel each other using a variety of Monster, Spell, and Trap Cards to defeat their opponent's monsters and be the first to drop the other's Life Points to 0.Card Name: Rosaria, the Stately Fallen AngelCard Type: Effect MonsterCard Number: PRC1-EN016Set: 2029 Premium TinAttack/Defense: 2900/2400Attribute: EarthLevel: 8Monster Type: PlantPasscode: 81146288Card Text: Cannot be Normal Summoned or Set. Must first be Special Summoned (from your hand) by banishing 2 Level 7 or higher Plant-Type monsters (one from your hand and one from your Graveyard). Once per turn, during your Main Phase: You can negate the effects of all other face-up cards currently on the field, until the End Phase. Yu-Gi-Oh! is a strategic trading card game in which two players Duel each other using a variety of Monster, Spell, and Trap Cards to defeat their opponent's monsters and be the first to drop the other's Life Points to 0.Card Name: Rosaria, the Stately Fallen AngelCard Type: Effect MonsterCard Number: LC5D-EN095Set: Legendary Collection 5D's Mega PackAttribute: EarthLevel: 8Monster Type: PlantPasscode: 81146288Card Text: Cannot be Normal Summoned or Set. 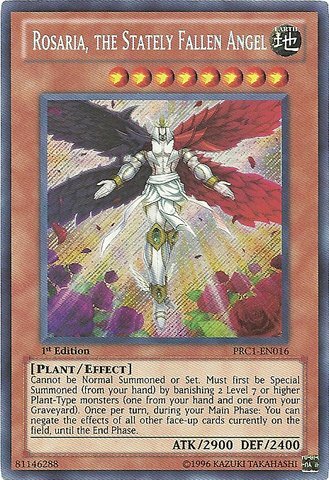 Must first be Special Summoned (from your hand) by banishing 2 Level 7 or higher Plant-Type monsters (one from your hand and one from your Graveyard). Once per turn, during your Main Phase: You can negate the effects of all other face-up cards currently on the field, until the End Phase. Yu-Gi-Oh! 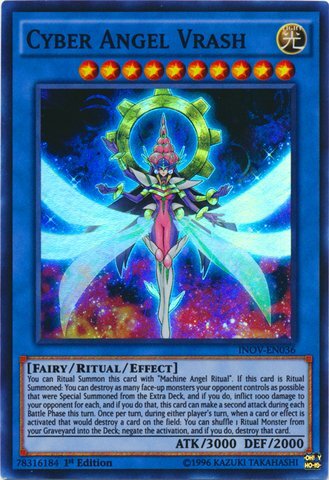 is a strategic trading card game in which two players Duel each other using a variety of Monster, Spell, and Trap Cards to defeat their opponent's monsters and be the first to drop the other's Life Points to 0.Card Name: Cyber Angel VrashCard Number: INOV-EN036Attribute: LIGHT Level: 10Monster Type: Fairy / Ritual / EffectPasscode: 78316184Card Text: You can Ritual Summon this card with "Machine Angel Ritual". 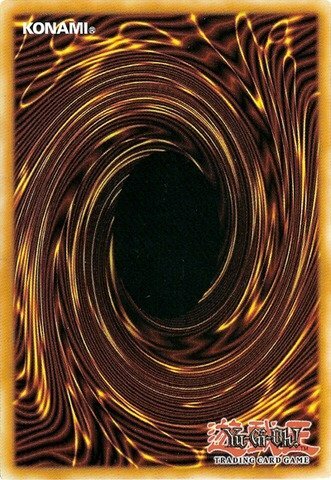 If this card is Ritual Summoned: You can destroy as many face-up monsters your opponent controls as possible that were Special Summoned from the Extra Deck, and if you do, inflict 1000 damage to your opponent for each, and if you do that, this card can make a second attack during each Battle Phase this turn. 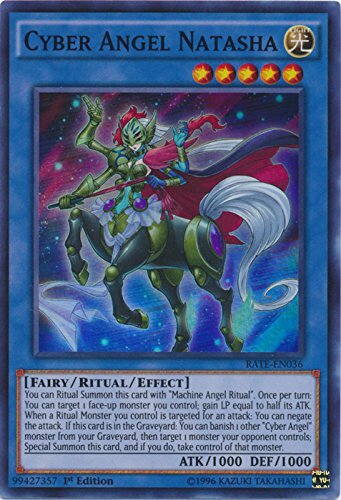 Once per turn, during either player's turn, when a card or effect is activated that would destroy a card on the field: You can shuffle 1 Ritual Monster from your Graveyard into the Deck; negate the activation, and if you do, destroy that card. Yu-Gi-Oh! 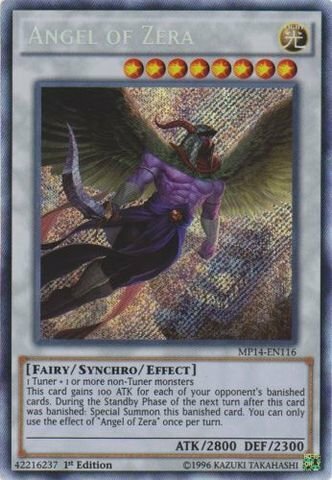 is a strategic trading card game in which two players Duel each other using a variety of Monster, Spell, and Trap Cards to defeat their opponent's monsters and be the first to drop the other's Life Points to 0.Card Name: Angel of ZeraCard Type: Synchro MonsterCard Number: MP14-EN116Set: Mega Pack 2014Attribute: LightLevel: 8Monster Type: FairyPasscode: 42216237Card Text: 1 Tuner + 1 or more non-Tuner monstersThis card gains 100 ATK for each of your opponent's banished cards. During the Standby Phase of the next turn after this card was banished: Special Summon this banished card. You can only use the effect of "Angel of Zera" once per turn. Yu-Gi-Oh! 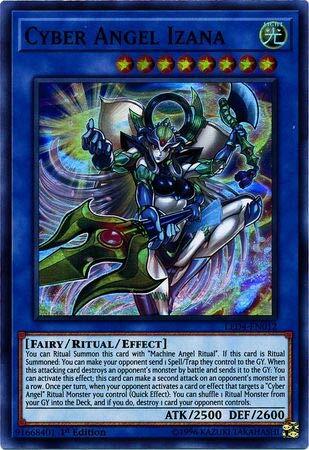 is a strategic trading card game in which two players Duel each other using a variety of Monster, Spell, and Trap Cards to defeat their opponent's monsters and be the first to drop the other's Life Points to 0.Card Name: Machine Angel RitualCard Type: Spell Card Card Number: DRL3-EN015Passcode: 39996157Card Text: This card can be used to Ritual Summon any "Cyber Angel" Ritual Monster. You must also Tribute monsters from your hand or field whose total Levels equal or exceed the Level of the Ritual Monster you Ritual Summon. If a LIGHT monster(s) you control would be destroyed by battle or card effect while this card is in your Graveyard, you can banish this card instead.